I think this may just be my manicure for Christmas Eve! 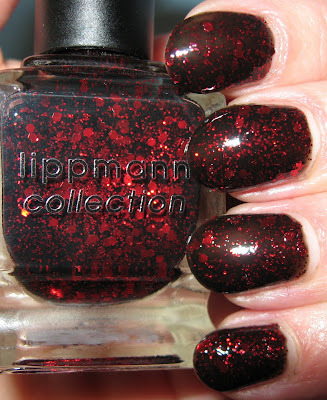 Ruby Red Slippers is nothing short of stunning. It has a blackened base that upon the first coat, is a watery charcoal color with sparse coverage. The second coat builds the base and the glitter to near perfection, although I think I may opt for 3 thin coats when I do this again tomorrow. What you end up with is an abundance of sparkling rubies awash in a sea of black glossiness. Top it off with a matte top coat and you get another look altogether. Simply put, I love this one. Lurve!! You have inspired me to use this polish, I got it recently and am putting it on right now!! I agree that maybe 3 coats would be best....to get the max red glitter cover?? 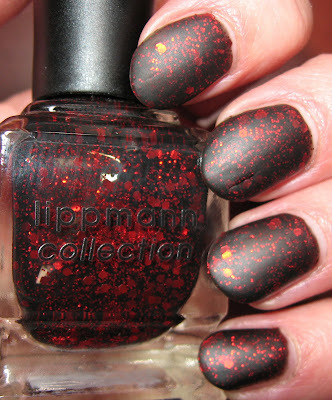 Love your pics and the matte topcoat is awesome!! I love the non mattify version. Red giltters never goes wrong for the holiday season! I'm using red glitters too (OPI's Smitten With Mittens) top up with acrylic flowers and leaves! This is my current mani and I love it. I get so many compliments on it. Matte looks cool! I really like it a lot when it's matte. I would love to buy it but it's too expensive! I really like this polish. It looks so cool matte, too. Love this! I really wanna start trying glitter polish now. They look gorgeous! Euridice~I'm glad I inspired you! It's a lovely shade, matte or otherwise. Nathalie~isn't it though? This is a must-have polish. gildedangel~it's one of those polishes you just can't stop looking at! Jin~yes, they're great, especially this time of year! Your mani sounds lovely! itskarmababy~it is one of my favorites. I'd love to see an antire collection of colors like this! Nina~they are a little pricey, but so worth it! Nihrida~thank you! I love it both ways. Nicole~once you start, you'll love it! This is one of the best, in my opinion.